Posted March 7, 2014 Cokie Roberts, a contributor to National Public Radio’s Morning Edition and political commentator for ABC News, will celebrate the contribution of women in American history as part of a forum sponsored by the Pioneer Institute, a public policy research organization. LWVMA is a co-sponsor of this exciting program. 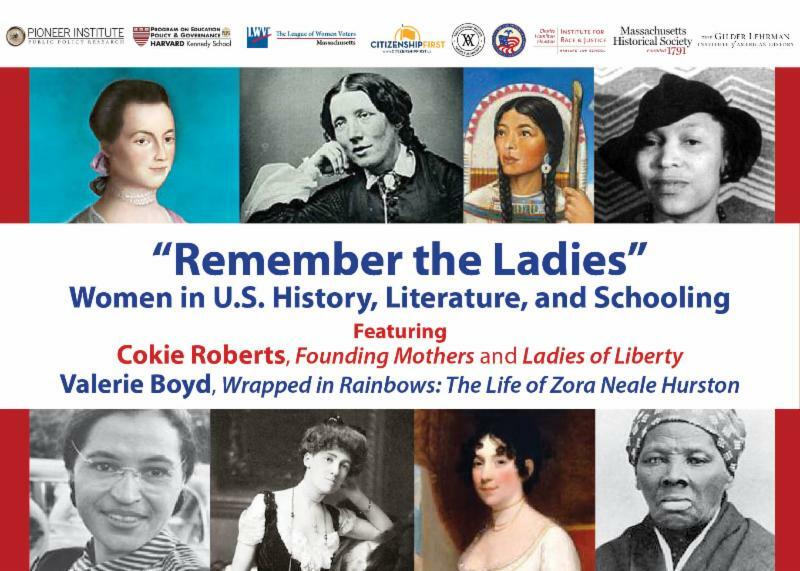 “Remember the Ladies: Women in U.S. History, Literature and Schooling” will be held at the Omni Parker House in downtown Boston Monday, March 24, from 12 p.m. to 3 p.m. The forum is free and open to the public, but reservations will be required. Roberts, author of two books, Founding Mothers and Ladies of Liberty, about women during the Colonial and Revolutionary eras, will discuss the role of women in American history. The other keynote speaker is Valerie Boyd, biographer of the African-American writer, Zora Neale Hurston. The keynote speakers will be followed by a panel of historians, academics and experts on K-12 education. For an event flyer, click here. And register for the event here.